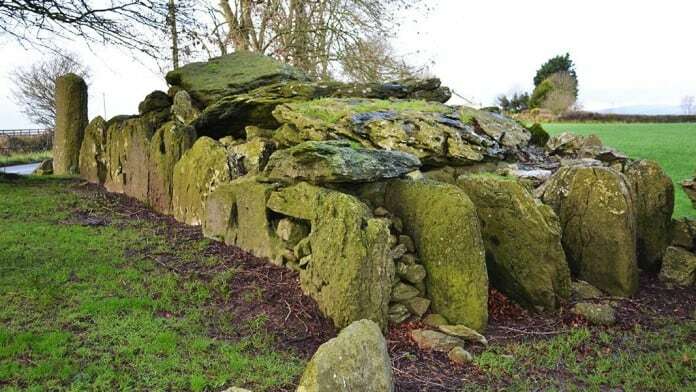 The Labbacallee Wedge Tomb is the largest example of its type in Ireland. These megalithic structures are so called because of their shape – they decrease in height and width from the front to the back. 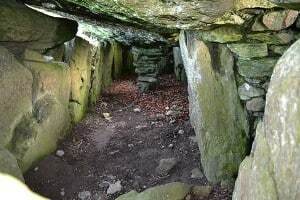 They are the most numerous of the megalithic tombs found in Ireland and are mostly located in the west of the country. They generally date between the Late Neolithic period and the Early Bronze Age. If we could only journey back through the mists of time to around the year 2300 B.C.E, we would lay eyes on a disturbing scene. The decapitated (and somewhat decomposed) body of a woman was buried here at the Labbacallee Wedge Tomb at around that time in a cramped secret chamber within the larger tomb. Her head was interred separately in the main body of the megalithic construction, propped gruesomely upright between two pieces of another skull from a teenage boy. We can only speculate why her remains were divided and buried in this bizarre way. Many thousands of years later, local folklore tells us that the tomb was known as ‘Leaba Caillighe’ (The Hag’s Bed), leading commentators to wonder if there might perhaps be some sort of connection between this eerie Bronze Age burial and the more modern tales of witchcraft which are synonymous with this part of rural Ireland. The famous antiquarian writer John Aubrey referred to the tomb in his writings of 1693. The tomb has made history as the first of its type to be subjected to a ‘modern’ archaeological survey. This excavation, led by H.G. Leask, took place in 1934. During the process of excavation, the team realised that one of the uprights was designed to move aside, and on doing so the main chamber was revealed. Here they found evidence suggesting that the structure had been used domestically at some point during the Iron Age. In total, the tomb measures thirteen metres in length and six metres in width at its largest point. The front of the tomb is placed where it is eerily bathed in the light of the setting sun during the March and September equinoxes. Body parts from at least five people were found in the tomb during the course of the excavations, including those of the headless woman. When the team led by H. G. Leask first opened the capstone leading to the second hidden chamber, they found a small space packed with a mix of stones, fragments of pottery and, more chillingly, cremated human bones. In one corner they found a portal that led from the larger chamber to the smaller. This, they surmise, may have been used as a way to add further remains or other burial paraphernalia. It was not until the smaller chamber had been nearly completely stripped that the archaeologists came across the decapitated remains of the headless woman. They observed that the condition of skeleton indicated that it had been in a state of decomposition when it was buried. This led them to wonder whether the body had been buried elsewhere and then moved. A delicate bone pin that was found just beside the remains may have been used to secure the shroud in which the body was wrapped. It was also noted that the skeleton showed signs of a malformed leg. This fact inevitably leads us to speculate that this unfortunate woman was perhaps deemed to be not quite human simply because of her physical handicap. While this does seem plausible, there are of course many more mundane explanations for the manner of her burial. It is possible that she may have been laid to rest in this way because she was revered as a goddess, or even that the way her skull was placed was one of the first examples of the ‘Cult of the Head’, which was followed by the Celts. It is perfectly possible that it was only when the issue of witchcraft raised its barbaric head centuries later that this tomb began to enter folklore as the final resting place of a ‘hag’. A view from the southern side showing the remains of the kerbing of the cairn that once covered this huge megalithic monument along with a modern cairn in the foreground. Ireland largely escaped the witch inquisitions that raged across Britain and Continental Europe between the fifteenth and eighteenth centuries, and which peaked between approximately 1580 and 1630. Starting from the sixth century, many people in Ireland followed a Celtic-influenced Christianity and continued to do so right up until the time of the Norman Invasion. This version of Christianity incorporated and was tolerant of local practices, including sorcery and magic, justifying them by making them attributable to saints. Because of this, fearful concepts such as the Devil and the witch, which led to such bloodshed elsewhere, did not resonate in same way in Ireland as they did elsewhere. Whatever the provenance and history of the remains found in the Labbacallee Wedge Tomb, there is no doubt that it is a site around which legends abound. One of the most pervasive legends tells that one day, very long ago, four local men went to the tomb in the middle of the night, with the aim of digging for the treasure that they had heard was buried there. As they started to dig, it is said that an enchanted cat appeared, fire bursting from its tail, terrifying the men, who were dazzled by the light emitting from it. Panicking, they ran screaming from the scene, and in the ensuing panic one fell into the nearby river and drowned. The remaining men lived to tell the tale, and their experience stood as a stark warning to others that they should never, under any circumstances, disturb the resting place of the long dead at this most mysterious of megalithic sites. The Labbacallee Wedge Tomb is easy to locate. From Fermoy, head north on the N72, and then take a slight right on to the R512. After approximately 3.2km, you will turn right to the megalithic tomb, which is located over a stile behind a stone wall. There is room to park on the roadside and entrance to the tomb is free.